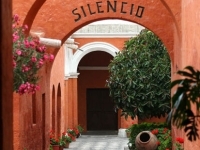 Enclosed within high walls is the Santa Catalina Monastery: an enormous complex of rooms, pretty little plazas and ornate fountains, a maze of narrow cobbled streets, chapels, beautifully decorated archways, and boxes of red geraniums. The thick and brightly painted walls contain numerous cells that once housed over 200 members of the female nobility who chose to shut themselves away from the rest of the world in a life devoted entirely to prayer. Some 400 years later the monastery was opened to the world and since then visitors have been able to wander through the exquisitely finished gates and admire the valuable collection of some of the finest examples of existing Spanish American religious art that decorate the walls. Today, about 30 resident nuns live out of sight in the northern part of the complex. A few noteworthy sights are the Orange Tree Cloister, painted a sky-blue with beautiful murals decorating the vaulted arches; the huge 17th-century kitchen with its blackened walls; and the long and narrow street known as Calle Toledo, which is the oldest part of the monastery and leads to the open air laundry where the nuns washed their clothes in large jugs filled from the canal. Unlike any other church compound, Santa Catalina is a masterpiece of colonial architecture, and is the most fascinating religious complex in Peru.